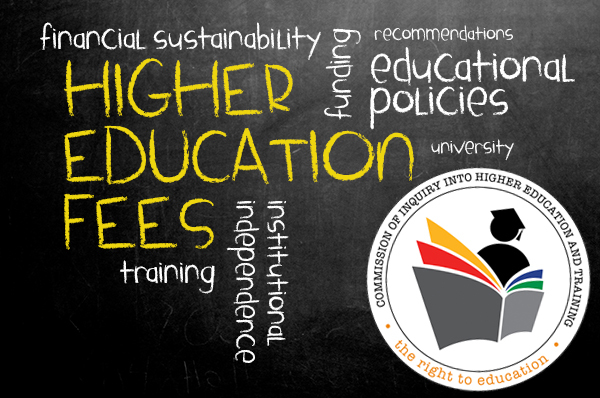 The Commission of Inquiry into Higher Education and Training (The Fees Commission) was established in terms of section 84(2)(f) of the Constitution of the Republic of South Africa, 1996. The Honourable Justice Jonathan Arthur HEHER was appointed as the chairperson, and Advocate Gregory ALLY and Ms Leah Thabisile KHUMALO, an attorney, as members of the Commission. Subimission by 2015 Durban Statement on Transformation in Higher Education; delivered at the Higher Education Transformation Summit, 2015. Subimission by the Ministerial Oversight Committee on Transformation in South African Public Universities, September 2015, Annexure 8. Concept paper prepared for the second national Higher Education Transformation Summit, 2015.